Find out the correct method of painting a wooden floor, what you will need, what you have to do to prepare before painting and how to repair imperfections. 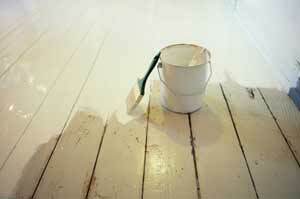 Learn how to prepare a wooden floor for painting, including sealing and filling. If you have good wooden floorboards but they’re not nice enough to varnish or stain, or if they’re already painted, a lick of paint will give them a fresh new look and brighten up the place. You’ll be amazed at how much cleaner and lighter a room feels if you paint the floor with a white or off-white colour. Or you can give a room a really different look by using a brighter colour. What Do I Need To Paint Wooden Floors? Specific floor paints are available, and it is best to use one of these as they are developed to withstand the massive amount of wear and tear a floor receives. Floor paints are resistant to not only wear from foot-traffic, but also to flaking, chipping and peeling. Floor paint is also designed to be resistant to spills and stains. Some paints require primers/sealers while others don’t, so check on the tin. 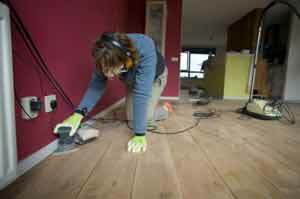 At the very least, you should prime any areas that have been sanded down to bare wood. You should also prime any knots in the wood, so buy a tin of wood primer. Make sure the primer you buy is suitable for the type of paint you are going to be using – ask advice in a DIY store if you’re not sure. You are likely to need some wood filler too, to fill in large cracks, knot holes, scratches and the likes. You can paint using a brush, roller or pad. You’ll need a brush for the edges at least, and you can buy long-handled brushes and paint pads specifically for use on floors and ceilings. Bear in mind the finish you want when deciding on how to apply the paint. A roller will leave a slightly stippled effect, and a brush will leave brush-marks. A paint pad is the one to use for the smoothest finish, but you may like the old-fashioned brushed look. If you’re planning to use a brush, get some knee pads and be prepared to use plenty of elbow grease! First of all, move all the furniture out of the room so you have a clear floor – it’s not a good idea to try doing a bit at a time, moving the furniture as you go. If you try to do this it will end up taking a lot longer, and everything will get very dusty when you sand the floor. If there is edging or beading around the edges of the floor, take this up if you can as it will make life easier. You may need to replace it with new, or you may be able to sand and repaint it then tack it back down again once you’ve finished the floor. No matter what the state of your floor is, whether it is painted, varnished, or bare wood, you need to sand it before you start. Depending on the size of the room and the state of the floor, you may want to hire a disc sander – this will do the job much quicker and mean less elbow-grease for you. If it’s a small floor in good condition you can get away with using a hand sander. Before you start sanding check over the floor to make sure there aren’t any nails sticking up. Once you’ve sanded the whole floor (make sure to get right to the edges, by hand if necessary or using a mouse sander with a pointed tip), you need to clean it really well. Use detergent and water, and mop over the whole floor. If there is any mold or mildew on the floor, use a bleach and water solution to clean it off. Once you floor is clean, rinse it using a mop and clean water. Allow the floor to dry completely before moving on to the next stage – this might take a couple of days. Go over the floor and look for any holes that need to be filled – use a general-purpose wood filler to fill these in and allow to dry. Then prime the floor where necessary – if you need to prime the whole floor, treat it like a paint job and use a roller or pad to save time and effort. Prime any bare wood, plus knots in the wood and filled areas. It is important to work with plenty of ventilation, but if you’re concerned about security and leaving windows open then make sure they are closed before you start. Many windows have a vent or lockable part-open setting that you can use to allow a through draft to provide ventilation. If you can’t keep the windows open, make sure you leave the door open and open windows elsewhere in the house. Using your brush, paint around the edges of the room, cutting in a couple of inches, being careful not to get any paint on the skirting. 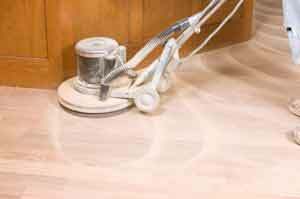 Then take your implement of choice, be it roller, brush or pad, and get to work on the main area of the floor. Make sure you start at the furthest corner move backwards towards the door, leaving yourself an escape route. Dip your roller/pad/brush and wipe off the excess paint. Paint along the length of the wood grain, starting at a point away from you but that you can reach comfortably, and pulling the roller/pad/brush towards you. Work on a small area within your reach at a time, moving across the room and then back. Make sure you blend well where overlapping between painted and fresh areas. Keep going to finish it all in one go if possible – it is much easier to blend and prevent lap marks if the paint is still wet. You will need to paint at least two coats – check on the tin for drying times between coats. The thinner the coat, the more hard-wearing it will be, as it will dry harder. But if you are applying thin coats you may need more than two. Leave the paint for as long as possible before walking on it – at least 24 hours. Try to leave for a few more days before moving furniture back in, as most paints will continue drying and curing to a harder finish for some time after you think it is dry.